Nice, la ville neuve née du tourisme, ou l’invention de la Riviera is part of the Tentative list of France in order to qualify for inclusion in the World Heritage List. I visited Nice, France during the later part of October 2007. The holiday crowds were gone, the temperature required a light jacket, and the day I spent the most time by the Promenade, it was overcast and gray. There were however, a couple highlights. 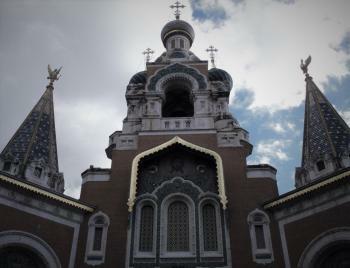 Cathedral of Saint Nicholas, a beautiful Eastern Orthodox Church that was built for the Russian nobility who visited Nice during the Early 20th century. The nomination description includes a full section on "- Places of worship and cemeteries", which relates to foreigners who "Wintered" in Nice. Another highlight was the National Museum of Marc Chagall, which is a wonderful small gallery dedicated to an artist who lived just outside Nice for decades. Its worth noting the nomination includes justification for criteria vi, "The city is thus directly associated with artistic and literary works of outstanding universal significance. This is particularly true for painting with Henri Matisse, Marc Chagall, Raoul Dufy, Max Beckmann and Edvard Munch, who lived in Nice and represented the city in major works." I was not overly impressed or awed by Nice. I appreciate the creativity and the persistent ability of France to pursue new nominations. Perhaps Nice has a shot.